From years in the design industry, I've used more than my share of Post-It Notes: color-coded, clustered and grouped, with text and doodles, trying to find those all-important "insights." Inevitably, the result is captured with a few photos, then archived for reference. 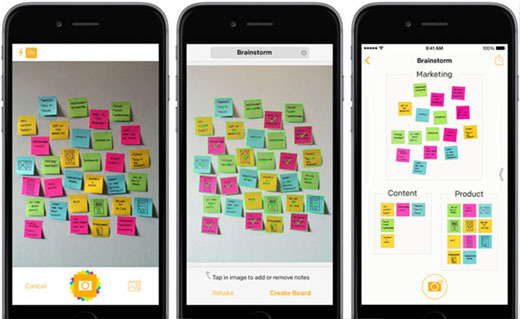 However, 3M thinks Post-Its can make a more useful digital transition, offering an app where individual notes are captured from that overall photo and made sortable on your device of choice. Granted, it won't be as smooth as the life-size tactile interaction of paper squares (at least not until we have wall-sized touchscreens in project rooms), but it's a start!